Research: I am a Research Aquatic Biogeochemist / Hydrologist located in Boulder, Colorado. My research focuses on the role of inland waters in the global carbon cycle and on hydrologic, climatic, and disturbance controls on the biogeochemical cycling, sequestration, transport, and surface-atmosphere exchange of aquatic carbon. Investigations conducted by me and my research group address a broad range of field, laboratory and modeling studies, including the transport of inorganic and organic carbon by surface and subsurface waters; the production, consumption, and atmospheric exchange of carbon dioxide and methane by streams, rivers, lakes, reservoirs, and soils; the effects of climate warming, permafrost thaw, and other disturbances on the carbon cycle of subarctic and boreal regions; and extrapolation of inland waters carbon biogeochemical processes and rates of carbon exchange from site to regional, continental, and global scales. I lead USGS LandCarbon investigations of Ecosystem Carbon Sequestration and Greenhouse Gas Exchange by Inland Waters of the USA and am also the Principal Investigator of the NASA Arctic-Boreal Vulnerability Experiment (ABoVE) project "Aquatic Vulnerabilites of Inland Waters and the Aquatic Carbon Cycle to Changing Permafrost and Climate across Boreal North America". Butman, D., Stackpoole, S., Stets, E., McDonald, C.P., Clow, D.W., and Striegl, R.G., 2016, Aquatic carbon cycling in the conterminous United States and implications for terrestrial carbon accounting, Proceedings of the National Academy of Sciences of the USA, v. 113 (1), pp. 58-63. Dornblaser, M.M., and Striegl, R.G., 2015, Switching predominance of organic versus inorganic carbon exports from an intermediate-size subarctic watershed, Geophysical Research Letters, doi:10.1002/2014GL062349. Drake, T.W., Wickland, K.P., Spencer, R.G.M., McKnight, D.M., and Striegl, R.G., 2015, Ancient low-molecular-weight organic acids in permafrost fuel rapid carbon dioxide production upon thaw, Proceedings of the National Academy of Sciences of the USA, V. 112 (45), pp. 13946-13951. Vonk, J.E., Tank, S.E., Mann, P.J., Spencer, R.G.M., Treat, C.C., Striegl, R.G., Abbott, B.W., amd Wickland, K.P., 2015, Biogedradability of dissolved organic carbon in permafrost soils and aquatic systems: A meta-analysis, Biogeosciences, v. 12 (23), pp.6915-6930. Jorgenson, M.T., Kanevskiy, M., Shur, Y., Moskalenko, N., Brown, D.R.N., Wickland, K., Striegl, R., and Koch, J., 2015, Role of ground ice dynamics and ecological feedbacks in recent ice wedge degradation and stabilization, Journal of Geophysical Research - Earth Surface, doi: 10.1002/2015JF003602. Green, C.T., Walvoord, M.A., Andraski, B.J., Striegl, R.G., and Stonestrom, D.A., 2015, Multimodal analysis of anisotropic diffusive tracer-gas transport in a deep arid unsaturated zone, Water Resources Research, doi:10.1002/2014WR016055. Ewing, S.A., Paces, J.B., O'Donnell, J.A., Jorgenson, M.T., Kenevskiy, M.Z., Aiken, G.R., Shur, Y., Harden, J.W., and Striegl, R., 2015, Uranium isotopes and dissolved organic carbon in loess permafrost: Modeling the age of ancient ice, Geochimica et Cosmochimica Acta, doi:10.1016/gca.2014.11.008. Crawford, J.T., Dornblaser, M.M., Stanley, E.H., Clow, D.W., and Striegl, R.G., 2015, Source limitation of carbon gas emissions in high-elevation mountain streams and lakes, Journal of Geophysical Research - Biogeosciences, doi:10.1002/2014JG6002861. Clow, D.W., Stackpoole, S.M., Verdin, K.L., Butman, D.E., Zhu, Z., Krabbenhoft, D.P., and Striegl, R.G., 2015, Organic carbon burial in lakes and reservoirs of the conterminus United States, Environmental Science and Technology, doi:10.1021/acs.est.5b00373. Creed, I.F., McKnight, D.M., Pellerin, B.P., Green, M.B., Bergamaschi, B.A., Aiken, G.R., Burns, D.A, Findlay, S.E.G., Shanley, J.B, Striegl, R.G., Aulenbach, B.T., Clow. D.W., Laudon, H., McGlynn, B.L., McGuire, K.J., Smith, R.A., and Stackpoole, S.M., 2015, The river as a chemostat: fresh perspectives on dissolved organic matter flowing down the river continuum, Canadian Journal of Fisheries and Aquatic Sciences, doi:10.1139/cjfas-2014-0400. Stackpoole, S., Stets, E., and Striegl, R., 2014, The impact of climate and reservoirs on longitudinal riverine fluxes from two major watersheds in the Central and Intermontane West, Journal of Geophysical Research-Biogeosciences, doi:10.1002//2013JG002496. Walvoord, M.A., Andraski, B.J., Green, C.T., Stonestrom, D.A., and Striegl, R.G., 2014, Field-scale sulfur hexafluoride tracer experiment to understand long distance gas transport in the deep unsaturated zone, 2014, Vadose Zone Journal, doi:10.2136/vzj2014.04.0045. Crawford, J.T., Lottig, N.R., Stanley, E.H., Walker, J.F., Hanson, P.C., Finlay, J.C., and Striegl, R.G., 2014, CO2 and CH4 emissions from streams in a lake-rich landscape: Patterns, controls and regional significance, Global Biogeochemical Cycles, doi:10.1002/2013GB004661. Stackpoole, S., Butman, D., Clow, D., McDonald, C., Stets, E., and Striegl, R., 2014, Chapter 5 - Carbon sequestration, transport, and emission from inland aquatic ecosystems in the Eastern United States, in Z. Zhu and Reed, B.C., eds., Baseline and projected future carbon storage and greenhouse-gas fluxes in ecosystems of the Eastern United States: U.S. Geological Survey Professional Paper 1804, 204 p.
Aiken, G.R., Spencer, R.G.M., Striegl, R.G., Schuster, P.F., and Raymond, P.A., 2014, Influences of glacier melt and permafrost thaw on the age of dissolved organic carbon in the Yukon River basin, 2014, Global Biogeochemical Cycles, doi:10.1002/2013GB004764. Crawford, J.T., Stanley, E.H., Spawn, S.A., Finlay, J.C., Loken, L.C., and Striegl, R.G., 2014, Ebullitive methane emissions from oxygenated wetland streams, Global Change Biology, doi:10.1111/gcb.12614. Raymond, P.A., Hartmann, J., Lauerwald, R., Sobek, S., McDonald, C., Hoover, M., Butman, D., Striegl, R., Mayorga, E., Humborg, C., Kortelainen, P., Dürr, H., Meybeck, M., Ciais, P., and Guth, P., 2013, Global carbon dioxide emissions from inland water, Nature, doi:10.1038/nature12760. Jorgenson, M.T., Harden, J., Kanevskiy, M., O'Donnell, J., Wickland, K., Striegl, R., and Koch, J., 2013 Reorganization of vegetation, hydrology and soil carbon after permafrost degradation across heterogeneous boreal landscapes, Environmental Research Letters, doi:10.1088/1748-9326/8/3/035017. Koch, J.C., Runkel, R.L., Striegl, R.G., amd McKnight, D.M., 2013, Hydrologic controls on the transport and cycling of carbon and nitrogen in a boreal catchment underlain by permafrost, Journal of Geophysical Research-Biogeosciences, doi://10.1002/jgrg.20058. Crawford, J.T., Striegl, R.G., Wickland, K.P., Dornblaser, M.M., and Stanley, E.H., 2013, Emissions of carbon dioxide and methane from a headwater stream network of interior Alaska, Journal of Geophysical Research – Biogeosciences, doi://10.1002/jgrg.20034/1. Burkett, V. R., D.A. Kirtland, I.L. Taylor, J. Belnap, T.M. Cronin, M.D. Dettinger, E.L. Frazier, J.W. Haines, T.R. Loveland, P.C.D. Milly, R. O’Malley, R.S. Thompson, A.G. Maule, G. McMahon, and R.G. Striegl, 2013, U.S. Geological Survey Climate and Land Use Change Science Strategy - A Framework for Understanding and Responding to Global Change, U.S. Geological Survey Circular 1383-A, 43 p.
McDonald, C.P., Stets, E.G., Striegl, R.G., and Butman, D., 2013, Inorganic carbon loading as a primary driver of dissolved carbon dioxide concentrations in the lakes and reservoirs of the contiguous United States, Global Biogeochemical Cycles, doi://10/1002/gbc.20032. Wickland, K.P., Aiken, G.R., Butler, K., Dornblaser, M.M., Spencer, R.G.M. and Striegl, R.G., 2012, Biodegradability of dissolved organic carbon in the Yukon River and its tributaries: Seasonality and importance of inorganic nitrogen, Global Biogeochemical Cycles, v.26, GB0E03, doi: 10.1029/2012GB004342. Downing, J.A., Cole, J.J., Duarte, C.M., Middelburg, J.J., Melack, J.M., Prairie, Y.T., Kortelainen, P., Striegl, R.G., McDowell, W.H., and Tranvik, L.J., 2012, Global abundance and size distribution of streams and rivers, Inland Waters, v.2, pp. 229-236, doi: 10.5268/IW-2.4.502. Kelsey, K.C., Wickland, K.P., Striegl, R.G., and Neff, J.C., 2012, Variation in soil carbon dioxide flux at two spatial scales in a topographically complex boreal forest, Arctic, Antarctic, and Alpine Research, doi:http://dx.doi.org/10.1657/1938-4246-44.4.457. Koch. J.C., Ewing, S.A., Striegl, R.G., and McKnight, D.M., 2012, Rapid runoff via shallow throughflow and deeper preferential flow in a boreal catchment underlain by frozen silt (Alaska, USA), Hydrogeology Journal, doi: 10.1007/s10040-012-0934-3. McDonald, C.P., Rover, J.A., Stets, E.G., and Striegl, R.G., 2012, The regional abundance and size distribution of lakes and reservoirs in the United States and implications for estimates of global lake extent, Limnology and Oceanography, v.57, no.2 597-606. Stackpoole, S., Butman, D., Clow, D., McDonald, C., Stets, E., and Striegl, R., 2012, Chapter 10 - Baseline carbon sequestration, transport, and emission from inland aquatic ecosystems in the western United States, in Z. Zhu and Reed, B.C., eds., Baseline and projected future carbon storage and greenhouse-gas fluxes in ecosystems of the Western United States: U.S. Geological Survey Professional Paper 1797, 192 p.
Stets, E. G., and Striegl, R.G., 2012, Carbon export by rivers draining the coterminous United States, Inland Waters, v.2, pp. 177–184, doi: 10.5268/IW-2.4.510. Striegl, R.G., Dornblaser, M.M., McDonald, C.P., Rover, J.R., and Stets, E.G., 2012, Carbon dioxide and methane emissions from the Yukon River system, Global Biogeochemical Cycles, 26, GB0E05, doi: 10.1029/2012GB004306. Stubbins, A., Hood, E., Raymond, P.A., Aiken, G.R., Sleighter, R.L., Hernes, P.J., Butman, D., Hatcher, P.G., Striegl, R.G., Schuster, P., Abdulla, H.A.N., Vermilyea, A.W., Scott, D.T., and Spencer R.G.M., 2012, Anthropogenic aerosols as a source of ancient dissolved organic matter in glaciers, Nature Geosciences, v. 5, no. 3, p. 198-201, doi:10.1038/NGEO1403. Tank, S. E., Frey, K.E., Striegl, R.G., Raymond, P.A., Holmes, R.M., McClelland, J.W., and Peterson, B.P., 2012, Landscape-level controls on dissolved carbon flux from diverse catchments of the circumboreal, Global Biogeochemical Cycles, v.26, GB0E02, doi: 10.1029/2012GB004299. Tank, S. E., Raymond, P.A., Striegl, R.G., Raymond, P.A., McClelland, J.W., Holmes, R.M., Fiske, G.J., and Peterson, B.P., 2012, A land-to-ocean perspective on the magnitude, source and implication of DIC flux from major Arctic Rivers to the Arctic Ocean, Global Biogeochemical Cycles, 26, GB4018, doi: 10.1029/2011GB004192. Frederick, Z.A., Striegl, R.G., and Anderson, S.P., 2011, Annual estimates of water and solute export from 42 tributaries to the Yukon River, Hydrological Processes, doi: 10.1002/hyp.8255. Grosse, G., Harden, J., Turetsky, M., McGuire, A.D., Camill, P., Tarnocai, C., Frolking, S., Schuur, E., Jorgenson, T., Marchenko, S., Romanovsky, V., Wickland, K., French, N., Waldrop, M., Bourgeau-Chavez, L., and Striegl, R., 2011, Vulnerability of high latitude soil carbon in North America to disturbance, Journal of Geophysical Research - Biogeosciences, v. 116, G00K06, doi:10.1029/2010JG001507. Pellerin, B.A., Bergamaschi, B.A., Murdoch, P.S., Downing, B.D., Saraceno, J. F., Aiken, G.R., and Striegl, R.G., 2011, The aquatic real-time monitoring network - in-situ optical sensors for monitoring the Nation’s water quality: U.S. Geological Survey Factsheet 2011-3061. Riggins, S., Striegl, R., and McHale, M., 2011, A whole ecosystem approach to studying climate change in interior Alaska, EOS, v. 92, n.18, p. 155. Holmes, R. M., J.W. McClelland, B.J. Peterson, S.E. Tank, E. Bulygina, T.I. Eglinton, V.V. Gordeev, T.Y. Gurtovaya, P.A. Raymond, D.J. Repeta, R. Staples, R.G. Striegl, A.V. Zhulidov, and S.A. Zimov. 2012. Seasonal and annual fluxes of nutrients and organic matter from large rivers to the Arctic Ocean and surrounding seas, Estuaries and Coasts, v. 35, no. 2, p. 369-382, doi: 10.1007/s12237-011-9386. Schuster, P.F., Striegl, R.G., Aiken, G.R., Krabbenhoft, D.P., DeWild, J.F., Butler, K., Kamark, B., and Dornblaser, M., 2011, Mercury export from the Yukon River basin and potential response to a changing climate: Environmental Science & Technology, v. 45, no. 21, p. 9262-9267. Striegl, R., del Giorgio, P., Karlsson, J., Tranvik, L., and Prairie, Y., 2011, Role of aquatic networks in the boreal carbon cycle, Limnology and Oceanography Bulletin, v.20, no.18, p. 36-37. Zhu, Z., ed., Bergamaschi, B., Bernknopf, R., Clow, D., Dye, D., Faulkner, S., Forney, W., Gleason, R., Hawbaker, T., Liu, J., Liu, S., Prisley, S., Reed, B., Reeves, M., Rollins, M., Sleeter, B., Sohl, T., Stackpoole, S., Stehman, S.,Striegl, R., Wein, A., and Zhu, Z., 2010, A method for assessing carbon stocks, carbon sequestration, and greenhouse-gas fluxes in ecosystems of the United States under present conditions and future scenarios: U.S. Geological Survey Scientific Investigations Report 2010-5233, 187 p.
Stets, E.G., Winter, T.C., Rosenberry, D.O., and Striegl, R.G., 2010, Quantification of surface water and groundwater flows to open- and closed-basin lakes in a headwaters watershed using a descriptive oxygen stable isotope model: Water Resources Research, v. 46, W03515, doi:10.1029/2009WR007793. Stets, E.G., Striegl, R.G., and Aiken, G.R., 2010, Dissolved organic carbon export and internal cycling in small, headwater lakes: Global Biogeochemical Cycles, v. 24, GB4008, doi:10.1029/2010GB003815. Spencer, R., Aiken G., Butler, K., Dornblaser M., Striegl R., Hernes, P., 2009, Utilizing chromophoric dissolved organic matter measurements to derive export and reactivity of dissolved organic carbon exported to the Arctic Ocean: A case study of the Yukon River, Alaska, 2009, Geophysical Research Letters, v. 34, L12402, doi:10.1029/2008. Stets, E. G., Striegl, R.G., Aiken, G.R., Rosenberry, D. O., and Winter, T.C., 2009, Hydrologic support of carbon dioxide flux revealed by whole-lake carbon budgets, J. Geophys. Res., 114, G01008, doi:10.1029/2008JG000783. Dornblaser, M. M. and Striegl, R.G. 2009, Suspended sediment and carbonate transport in the Yukon River basin, Alaska: Fluxes and potential future responses to climate change: Accepted by Water Resources Research. 45, W06411, doi:10.1029/2008WR007546. Tranvik, L.J., Downing, J.A., Cotner, J.B., Loiselle, S.A., Striegl, R.G., Ballatore, T.J., Dillon, P., Finlay, K., Fortino, K., Knoll, L.B., Kortelainen, P.L., Kutser,T., Larsen,S., Laurion, I., Leech, D.M., McCallister,S.L., McKnight,D.M., Melack, J.M., Overholt, E., Porter, J.A., Prairie, Y., Renwick, W.H., Roland, F., Sherman, B.S., Schindler, D.W., Sobek, S., Tremblay, A., Vanni, M.J., Verschoor, A.M., von Wachenfeldt, E., and Weyhenmeyer, G.A., 2009, Lakes and reservoirs as regulators of carbon cycling and climate: Limnology and Oceanography, v. 54, no. 6, part 2, 2298-2314. Riggs, A.C., Stannard, D.I., Maestas, F.B., Karlinger, M.R., and Striegl, R.G., 2009, Soil CO2 flux in the Amargosa Desert, Nevada, during the El Niño 1998 and La Niña 1999: U.S. Geological Survey Scientific Investigations Report 2009-5061, 25 p.
Walvoord, M.A., Andraski, B.J., Krabbenhoft, D.P., and Striegl, R.G., 2008, Transport of elemental mercury in the unsaturated zone from a waste disposal site in an arid region: Applied Geochemistry, v. 23, p. 572–583, doi: 10.1016/j.apgeochem.2007.12.014. McClelland, J.W., Holmes, R.M., Peterson, B.J., Amon, R., Brabets, T., Cooper, L.,. Gibson, J., Gordeev, V.V., Guay, C.,. Milburn, D., Staples, R., Raymond, P.A., Shiklomanov, I., Striegl, R., Zhulidov, A., and Gurtovaya, T., 2008, Development of a Pan-Arctic Database for River Chemistry: EOS, v. 89, n. 24, p. 217-218. Downing, J.A., Cole, J. J., Middelburg, J.J., Striegl, R.G., Duarte, C.M., Kortelainen, P., Prairie, Y.T., and Laube, K.A., 2008, Sediment organic carbon burial in agriculturally eutrophic impoundments over the last century: Global Biogeochem. Cycles, v. 22, GB1018, doi:10.1029/2006GB002854. Spencer, R.G., Aiken, G.R., Wickland, K.P., Striegl, R.G., and Hernes, P.J., 2008, Seasonal and spatial variability in dissolved organic matter quantity and composition from the Yukon River basin, Alaska: Global Biogeochem. Cycles, v. 22, GB4002, doi:10.1029/2008GB003231. Duarte, C.T., Prairie, Y.T., Montes, C., Cole, J.J., Striegl, R.G. Melack, J., and Downing., J.A., 2008, CO2 emissions from saline lakes: A global estimate of a surprisingly large flux: J. Geophys. Res., v. 113, G04041, doi:10.1029/2007JG000637. Cole, J., Prairie, Y., Caraco, N., McDowell, W., Tranvik, L., Striegl, R., Duarte, C., Kortelainen, P., Downing, J., Middleburg, J., and Melack, J., 2007, Plumbing the global carbon cycle: Integrating inland waters into the terrestrial carbon budget: Ecosystems, doi: 10.1007/s10021-006-9013-8. Dornblaser, M.M., and Striegl R.G., 2007, Nutrient (N, P) loads and yields at multiple scales and subbasin types in the Yukon River basin, Alaska: Journal of Geophysical Research – Biogeosciences, doi: 10.1029/2006JG000366. Raymond, P. A., McClelland, J.W., Holmes, R.M., Zhulidov, A.V., Mull, K., Peterson, B.J., Striegl, R.G.,. Aiken, G.R., and Gurtovaya, T.Y., 2007, Flux and age of dissolved organic carbon exported to the Arctic Ocean: A carbon isotopic study of the five largest arctic rivers: Global Biogeochemical Cycles, v. 21, GB4011, doi: 10.1029/2007GB002934. Striegl, R.G., Dornblaser, M.M., Aiken, G.R., Wickland, K.P., and Raymond, P.A., 2007, Carbon export and cycling by the Yukon, Tanana, and Porcupine Rivers, Alaska, 2001-2005, Water Resources Research, v. 43, W02411, doi: 10.1029/2006WR005201. Walvoord, M.A., and Striegl, R.G., 2007, Increased groundwater to stream discharge from permafrost thawing in the Yukon River basin: Potential impacts on lateral export of carbon and nitrogen: Geophysical Research Letters, v. 34, L12402, doi:10.1029/2007GL030216. Downing, J.A., Prairie, Y.T., Cole, J.J., Duarte, C.M., Tranvik, L.J., Striegl, R.G., McDowell, W.H., Kortelainen, P., Caraco, N.F., Melack, J.M., and Middelburg, J.J., 2006, The global abundance and size distribution of lakes, ponds, and impoundments: Limnology and Oceanography, v. 51, no. 5, p. 2388-2397. King, S.A., Behnke, S., Slack, K., Krabbenhoft, D.P., Nordstrom, D.K., Burr, M.D., and Striegl, R.G., 2006, Mercury in water and biomass of microbial communities in hot springs of Yellowstone National Park, USA: Applied Geochemistry, v.21, p. 1868-1879. Striegl, R.G. and Dornblaser, M.M., 2006, Dissolved gases and dissolved inorganic carbon, in Schuster, P.F., ed., 2006, Water and sediment quality in the Yukon River Basin, Alaska, during water year 2004: U.S. Geological Survey Open-File Report 2006-1258, chapter 6, p. 45-46. Wickland, K.P., Striegl, R.G., Neff, J.C., and Sachs, T., 2006, Effects of permafrost melting on CO2 and CH4 exchange of a poorly drained black spruce lowland: Journal of Geophysical Research, v. 111, G02011, doi: 10.1029/2005JG000099. Walvoord, M.A., Striegl, R.G., Prudic, D.E., and Stonestrom, D.A., 2005, CO2 dynamics in the Amargosa Desert: Fluxes and isotopic speciation in a deep unsaturated zone: Water Resources Research, v. 41, W02006, doi: 10.1029/2004WR003599. Striegl, R.G. and Dornblaser, M.M., 2005, Dissolved gases and dissolved inorganic carbon, in Schuster, P.F., ed., Water and sediment quality in the Yukon River Basin, Alaska, during water year 2002: U.S. Geological Survey Report 2005-1199, p. 56-57. Striegl, R.G. and Dornblaser, M.M., 2005, Dissolved gases and dissolved inorganic carbon, in Schuster, P.F., ed., Water and sediment quality in the Yukon River Basin, Alaska, during water year 2003: U.S. Geological Survey Open-File Report 2005-1397, p. 49-50. Striegl, R.G., Aiken, G.R., Dornblaser, M.M., Raymond, P.A., and Wickland, K.P., 2005, A decrease in discharge-normalized DOC export by the Yukon River during summer through autumn: Geophysical Research Letters, v. 32, L21413, doi:10.1029/2005GL024413. Walvoord, Michelle Ann; Striegl, Robert G.; Prudic, David E.; Stonestrom, David A.
CO2 dynamics in the Amargosa Desert: Fluxes and isotopic speciation in a deep unsaturated zone; 2005; Article; Journal; Water Resources Research; Walvoord, M. A.; Striegl, R. G.; Prudic, D. E.; Stonestrom, D. A. Response to comment on "A reservoir of nitrate beneath desert soils"
Walvoord, Michelle Ann; Phillips, Fred M.; Stonestrom, David A.; Evans, R. Dave; Hartsough, Peter C.; Newman, Brent D.; Striegl, Robert G.
A Reservoir of Nitrate Beneath Desert Soils; 2003; Article; Journal; Science; Walvoord, M. A.; Phillips, F. M.; Stonestrom, D. A.; Evans, R. D.; Hartsough, P. C.; Newman, B. D.; Striegl, R. G.
Clow, David W.; Sickman, James O.; Striegl, Robert G.; Krabbenhoft, David P.; Elliott, John G.; Dornblaser, Mark M.; Roth, David A.; Campbell, Donald H.
Krabbenhoft, David P.; Olson, Mark L.; DeWild, John F.; Clow, David W.; Striegl, Robert G.; Dornblaser, Mark M.; Van Metre, Peter C.
Clow, David W.; Striegl, Robert G.; Nanus, Leora; Mast, M. Alisa; Campbell, Donald H.; Krabbenhoft, David P.
Striegl, Robert G.; Kortelainen, Pirkko; Chanton, J.P.; Wickland, K.P. ; Bugna, G.C. ; Rantakari, M.
Carbon dioxide partial pressure and 13C content of north temperate and boreal lakes at spring ice melt; 2001; Article; Journal; Limnology and Oceanography; Striegl, R. G.; Kortelainen, P.; Chanton, J. P.; Wickland, K. P.; Bugna, G. C.; Rantakari, M.
Wickland, K.P. ; Striegl, Robert G.; Mast, M.A. ; Clow, D.W. Carbon gas exchange at a southern Rocky Mountain wetland, 1996-1998; 2001; Article; Journal; Global Biogeochemical Cycles; Wickland, K. P.; Striegl, R. G.; Mast, M. A.; Clow, D. W.
Striegl, Robert G.; Wickland, K.P. Soil respiration and photosynthetic uptake of carbon dioxide by ground-cover plants in four ages of jack pine forest; 2001; Article; Journal; Canadian Journal of Forest Research; Striegl, R. G.; Wickland, K. P.
Clow, D.W.; Campbell, D.H.; Mast, M.A. ; Striegl, Robert G.; Wickland, K.P. ; Ingersoll, G.P. 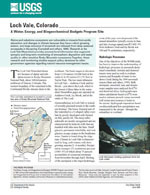 Loch Vale, Colorado: A Water, Energy, and Biogeochemical Budgets Program Site; 2000; FS; 164-99; Clow, D. W.; Campbell, D. H.; Mast, M. A.; Striegl, R. G.; Wickland, K. P.; Ingersoll, G. P.
Hutchinson, G.L. ; Livingston, G.P. ; Healy, R.W. ; Striegl, Robert G.